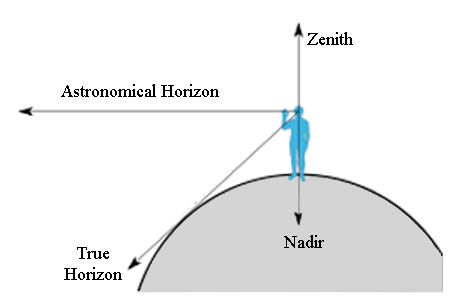 Diagram showing the relationship between the Zenith, the Nadir, and different types of Horizon. Note how the Nadir is opposite the Zenith. The nadir (from Arabic ندير nadeer نظير nathir, "opposite") is the astronomical term for the point directly below the observer, or more precisely, the point with an inclination of −90°. In simple terms, if you are standing on the Earth, it is the direction "down" toward your feet. Geometrically, it is the point on the celestial sphere intersected by a line drawn from the observer's location on the Earth's surface through the center of the Earth. The point opposite the nadir is the zenith. Nadir also refers to a downward-facing viewing angle of an orbiting satellite, such as is employed during remote sensing of the atmosphere, as well as when an astronaut faces the Earth while performing an EVA. 1. ^ Nadir definition. Miriam Webster's Online Dictionary. Retrieved on 2008-04-23. 2. ^ The Common Berthing Mechanism (CBM) for International Space Station. Society of Automotive Engineers, Inc. (2001). Retrieved on 2008-04-23. 3. ^ Nadir definition. Encyclopedia Britannica, 11th Edition. Retrieved on 2008-04-23.